Our aim is to provide state of the art acoustical advice and recommendations within cost effective budgets to clients in Kuwait. The firm helps add value of good acoustical conditions, reduce the risk of noise generating problems, and resolve existing acoustic concerns in buildings, workspaces, homes, industrial areas and the outdoor environment. 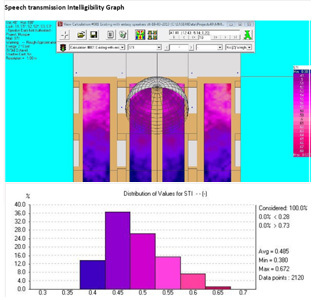 WE offer on site reverberation test and give you complete acoustic report generated by our EASE software. If proper acoustics is not considered, irrespective of how good your installed sound system is. If the room has bad acoustics, the sound will also be bad.